Shrubs, small trees, perennial herbs or, rarely annuals; plants glabrous or with unbranched or stellate trichomes. Leaves opposite or (rarely) whorled , simple , entire , usually with glandular dots and/or canals; in many alpine species leaves are needle- or scale-like. Inflorescences terminal thyrses or dichasia, occasionally raceme -like, or flowers solitary. Flowers with 5 sepals or rarely 4, often with variously shaped glands ; petals 5 or rarely 4, sometimes asymmetric , free , contorted , imbricate or (when 4) decussate in bud , yellow to orange or white, rarely greenish, red or pink, usually with dark, reddish or translucent glands (secretory cavities) and/or canals; stamens usually numerous, rarely as few as five, and basally united into a ring or more commonly into 3 or 5 antepetalous fascicles; anthers small, isodiametric, with a connective gland ; ovary superior , consisting of 2 - 5 carpels; styles free or basally fused; stigma not or slightly expanded; placentation central or parietal . Fruits septicidal capsules or berries. Seeds mostly small and numerous, sometimes winged . Recent studies, based on DNA sequence variation, have provided strong support for the Hypericaceae as delimited here (Ruhfel et al., 2011; Nurk et al., 2013a). These studies have also, surprisingly, shown that the closest relatives of the Hypericaceae are the Podostemaceae, a group of highly specialized aquatics found in fast-flowing streams. Closely related are also the Bonnetiaceae and the Clusiaceae, in which Hypericaceae have often been included in earlier classification systems. Native. One introduced species, the European Hypericumperforatum L., occurs in the area. 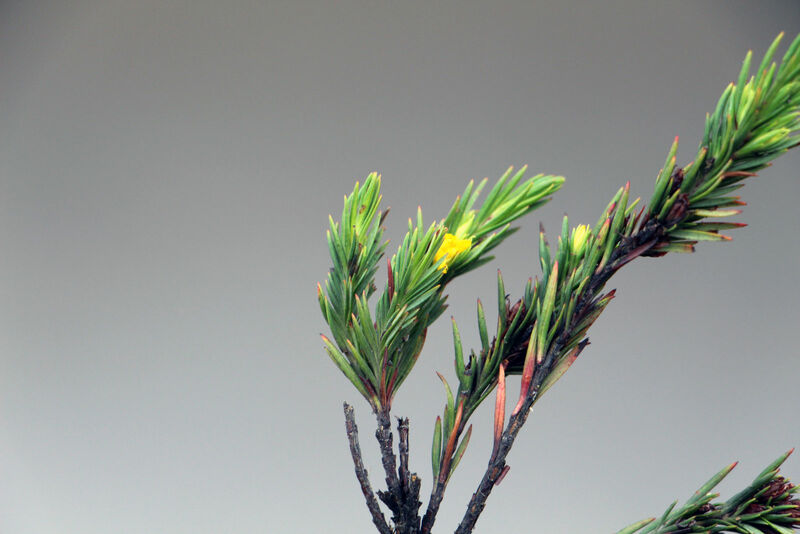 Hypericum has undergone a rapid and recent evolutionary radiation in the paramo zone, which is the vegetation above the forest limit in the northern Andes (Nurk et al., 2013b). 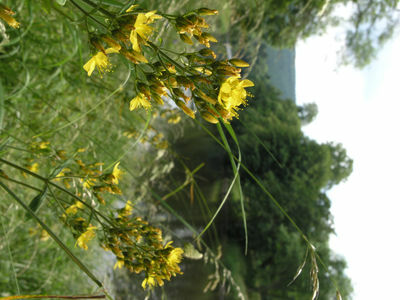 The area is not only rich in species, but the genus forms a prominent component in the vegetation. Some of the species vegetatively resemble junipers, Ericaceae or large mosses. Species of Vismia are common roadside plants in the forest zone of the Andes, and several of the species can be considered weedy. Seeds are dispersed by bats which eat the fruits. The genus Hypericum is a source of substances with various uses in medicine, e.g. for their antidepressant, anti-tumour or anti-proliferative activity. 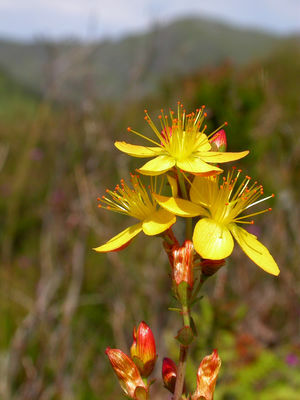 Hypericum L. occurs throughout the Neotropics, but the majority of species are found in the Northern Andes, an area where also Vismia Vand is most diverse. Secretory organs in the form of glands or canals are present in leaves and/or sepals and petals, appearing as reddish, dark or translucent dots or lines. Leaves are opposite or whorled, simple, entire and exstipulate. Petals are 4-5, free. Stamens/fascicles of stamens are positioned opposite the petals. The ovary is superior and consists of 2-5 carpels, developing into a berry or a septicidalcapsule. Stellate hairs sometimes cover most of the plant. Petals are often contorted and sometimes asymmetric. Stamens are usually numerous, in 3 or 5 fascicles. 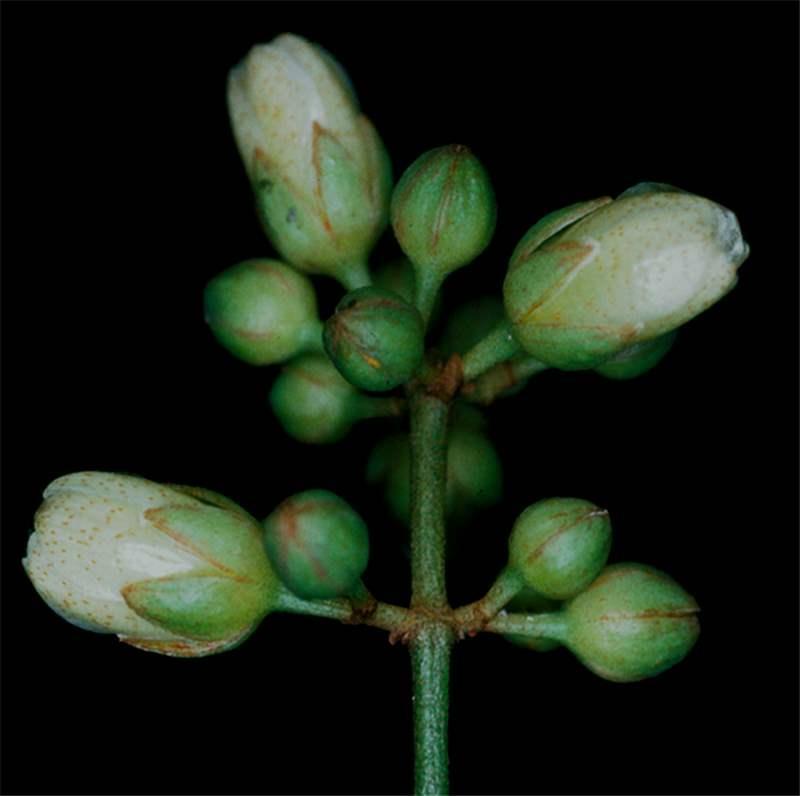 Anthers are usually isodiametric, with a gland on the connective. Yellow-flowering species of Gentianaceae may perhaps be mistaken for Hypericaceae but they lack glandular structures, orange latex (Vismia) and the corolla is sympetalous. Hypericum L. comprises a wide range of life-forms, ranging from annuals to ericoid shrubs, moss-like alpines and small trees. Most species are glabrous (rarely with simple hairs) with contortedpetalaestivation and capsular fruits. Hypericum is an important element in paramo vegetation, while occurring scattered in other habitats, rare in lowland rainforests. In the Neotropics there are 140-150 species (ca. 420 worldwide). 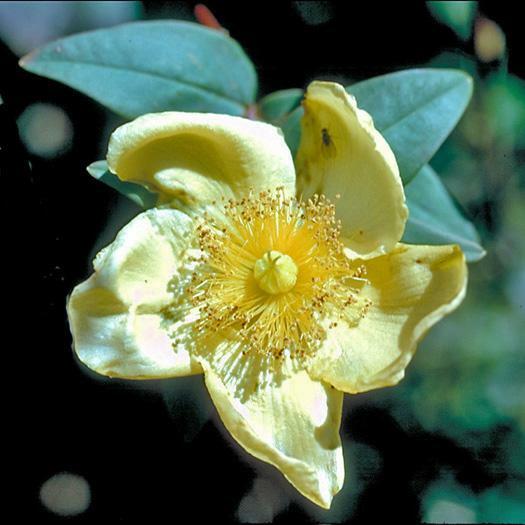 Opinions among scientists are divided regarding the inclusion of the small Central American genera Santomasia N. Robson (monotypic) and Thornea Breedlove & McClintock (2 species) in Hypericum. Vismia Vand. is a genus of shrubs and small trees with dense, usually brownish indument of stellate hairs covering young stems and the lower side of the leaves. Also the petals are hairy. Vismia is distinct from Hypericum in, for example, hairy, imbricate petals, baccate fruits and orange latex. The genus is frequent in montane forests, especially in disturbed areas, but is also found in lowland habitats. Vismia is strictly neotropical and comprises around 60 species. Nürk, N. M., S. Madriñan, M. Carine, M. W. Chase and F. R. Blattner. 2013a. 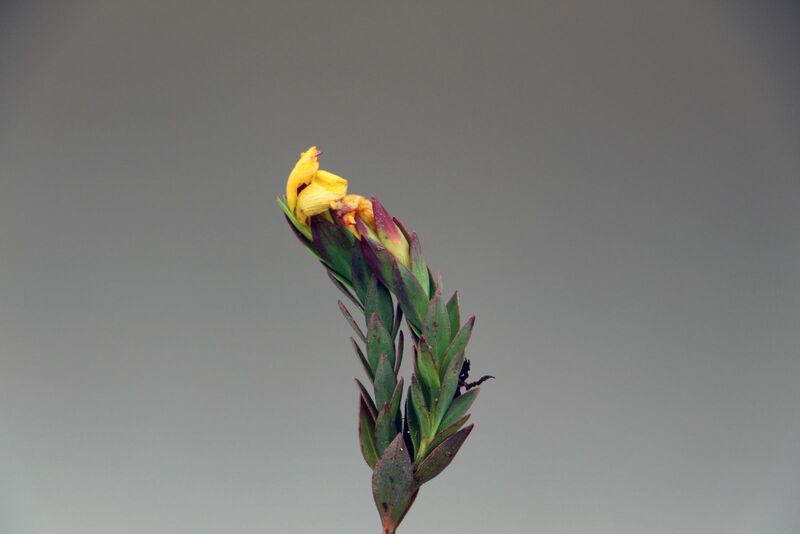 Molecular phylogenetics and morphological evolution of St. John's wort (Hypericum; Hypericaceae). Molecular phylogenetics and Evolution 66(1): 1-16.Nürk, N. M., C. Scheriau and S. Madriñan. 2013b. Explosive radiation in high Andean Hypericum - rates of diversification among New World lineages. Frontiers in Genetics 4(175): 1-14. Robson, N. K. B. 1981. Studies in the genus Hypericum L. (Guttiferae) 2. Characters of the genus. Bulletin of the British Museum (Natural History). Botany series 8: 55-226.Robson, N. K. B. 1987. Studies in the genus Hypericum L. (Guttiferae) 7. Section 29. Brathys part 1). Bulletin of the British Museum (Natural History). Botany series 16: 1-106.Robson, N. K. B. 1990. Studies in the genus Hypericum L. (Guttiferae) 8. Section 29. Brathys (part 2) and 30. Trigynobrathys. Bulletin of the British Museum (Natural History). Botany series 20: 1-151. Robson, N. K. B. 1998. 16. Vismia Vand. In P. E. Berry, B. K. Holst and K. Yatskievych. Flora of the Venezuelan Guayana. Volume 4: 322-329. Missouri Botanical Garden, St. Louis. Ruhfel, B., V. Bittrich, C. Bove, M. H. G. Gustafsson, C. Philbrick, R. Rutishauser, Z. Xi and C. Davis. 2011. Phylogeny of the Clusioid clade (Malpighiales): evidence from the plastid and mitochondrial genomes. American Journal of Botany 98: 306-325.Stevens, P. F. 2007. Hypericaceae. In K. Kubitzki (ed.) Families and Genera of Vascular Plants. Volume IX: 194-201. Springer-Verlag, Berlin.